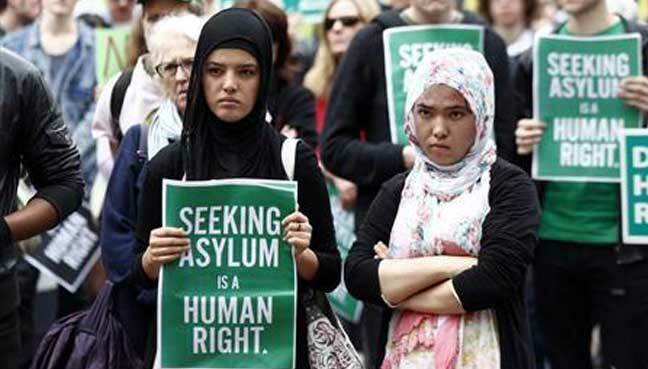 KUALA LUMPUR: About 50% of applicants to the Australian Administrative Appeals Tribunal (AAT) claiming refugee status in the second half of last year were Malaysians. According to a report in The Australian, a Senate Estimates hearing in Australia was told there had been a significant increase in migration and refugee appeals to the AAT over the past 18 months, largely driven by people from Malaysia. KUALA LUMPUR: Malaysia cannot be considered a haven for refugees despite the government’s recent pledge to take in thousands of people fleeing the war in Syria, a US-based news portal reports. In fact, Malaysia is a “living hell” for refugees, according to the Malaysian Social Research Institute (MSRI). “Based on my experience, I don’t think and I will never think that Malaysia is a good place for refugees,” MSRI counsellor Ronald Sutedja was quoted as saying by News Deeply. PETALING JAYA: There certainly is inconsistency in the way the government deals with refugees from various ethnicities and religions. However, say several people working with refugees or who are familiar with the situation, this is largely due to politics rather than religion. MP Charles Santiago and lawyer Latheefa Koya feel the government’s “ad hoc” approach is geared towards scoring political points while Tenaganita executive director Glorene Das wants the government to give equal protection to all refugees regardless of race or religion. KUALA LUMPUR: Asean lawmakers today urged regional governments to step up efforts to protect migrant workers and refugees. Asean Parliamentarians for Human Rights (APHR) board member Teddy Baguilat said both sending and receiving countries needed to do their part to end abusive recruitment and employment practices for migrant workers, and promote the security and rights of refugees fleeing persecution. Baguilat, who is a member of the Philippines House of Representatives, said Asean and member governments had a duty to ensure that all people, whether their own citizens or those from other countries, were protected. “This should include strengthening domestic and regional legal frameworks to provide security and enable people to pursue recourse and justice,” he said. PETALING JAYA: A child rights activist has urged society to help in making sure children never feel the need to run away from home. This comes after a Bernama report revealed that a 12-year-old girl had fled from her home in Taman Puchong Prima, Puchong, near here late at night after claiming to have been often abused with a cane by her father. A passerby found her at a petrol station at 12.30am on Monday and took her to a police station. PETALING JAYA: Sympathy helps but what NGOs involved in helping refugees need more is solid assistance. United Nations High Commissioner for Refugees (UNCHR) spokesperson Yante Ismail claimed that refugees were not helpless but were already finding solutions to their problems. “It is important to know that refugees are not just waiting for help or donations. “They are already finding solutions to their own problems, finding ways to cope while in exile and to stay strong as a community,” Yante told FMT. However, Yante quickly added that refugees were in dire need of opportunities and long-term solutions to support themselves while they are here in Malaysia. Among long-term solutions which the agency is trying to do are assisting refugees in voluntary deportation when conditions permit, temporary local integration, and resettlement to a third country. She also said there were many NGOs involved in supporting these refugees. ALOR SETAR: Two years after 106 bodies of human trafficking victims were exhumed in Wang Kelian, Perlis, the Malaysian Consul­tative Council of Islamic Organisation (Mapim) has expressed its dismay that only four people were charged in court over the matter. Its president Mohd Azmi Abdul Hamid said more could be done by the authorities as he believed those charged in court could be just the ikan bilis (small fry). Suhakam’s Jerald Joseph says the number of deaths is too many and is shocking and it calls for the overhaul of the system. ― Picture by Saw Siow Feng for the MMO. KUALA LUMPUR, March 30 ― More than one hundred foreigners died in the past two years in Malaysia’s immigration detention centres from various diseases and unknown causes, according to documents from the government-funded National Human Rights Commission reviewed by Reuters. The toll, which has not been previously disclosed, is based on Malaysian immigration department data provided to the commission, which is known by its Malay acronym Suhakam. There were 83 deaths in 2015, and at least 35 in 2016 up to December 20. It is unclear whether the death rate is higher than in neighbouring countries. Government officials in Indonesia and Thailand told Reuters they do not disclose such numbers. The rate is higher than in major industrialized nations such as the United States, which in the last financial year recorded 10 deaths in its immigration detention system, which has many more detainees than Malaysia’s. Latest findings: Shamini Darshni and Amnesty International Southeast Asia and Pacific Regional Office deputy director (campaigns) Josef Roy Benefit at the launch of the report in Kuala Lumpur. PETALING JAYA: A pilot programme to allow Rohingya refugees in Malaysia to work is a positive step taken by the Government with regards to human rights, says Amnesty International Malaysia.